Tagged under Kiyohiko Azuma, Series. The humor is the defining point of <i>Yotsuba&!</i>, and is usually an appropriate humor suited for almost any age (five to seven years or up, preferrably). The kanji written to describe movement does get a bit irksome, since I do not read Japanese, but the drawings make up for it. Some words in speech and thought bubbles are bolded or italicized, to show their significance or the stress on the word. 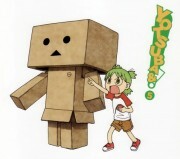 Back to humor - <i>Yotsuba&!</i> makes me laugh - and that is, what I think is most important in this story. Sure, the art is nice, the people as well, but what really keeps me interested is the fact that I can read something, and enjoy what people are doing, talking, or thinking. Oh, my goodness... this series is just hilarious. The comedy and timing are perfect! Laughing so much in every chapter. 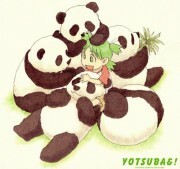 ^_^ Yotsuba has so many experiences and is full of energy all the time. Highly recommend this series.